› Outlook › Contacts › Help! My Contacts are being updated! Some of my contacts are in both the GAL and my local Contacts folder. Outlook updated my contacts (in my contacts folder) with information from the Global Address Book. How to disable this function? The GAL contains outdated information. This is a feature of the Social Connector, with the automatic updates of contacts enabled by default. A change log is added to notes so you know what was changed. Note: the social Connector is deprecated and may be removed from a future version. It is disabled by default in Outlook 2016. If you enable it, only the search features work. To change the setting in Outlook 2010 and up (if the Social Connector is enabled), go to the View ribbon, People Pane, Account Settings, Settings button and change the update option from Update without prompting to Prompt before update or Never update. 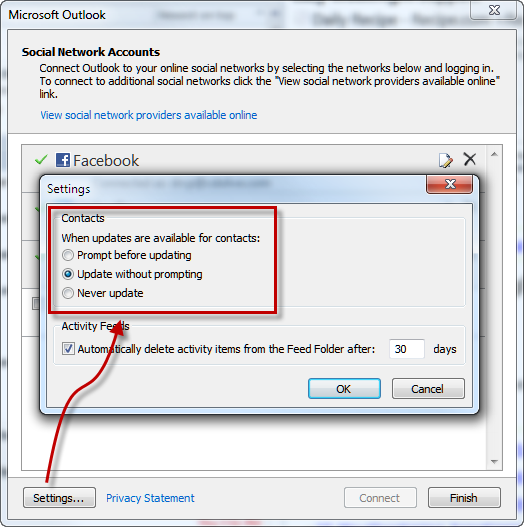 In Outlook 2003 or 2007, the Account Settings dialog is accessed from Tools, Social Networking Account settings. While it may be tempting to turn off updating, it defeats one purpose of the social connector: to keep your contacts updated. The change log in the notes field displays the changed data, should it try to update the contact with old information. This setting is stored in the registry. The key is the same for all versions of Outlook that support the Social Connector. If the key or value does not exist, add it. Default setting is Update without Prompting. Administrators can disable Contact & GAL sync using group policy. It's found under Outlook > Outlook Social Connector in the Group Policy editor. Look for Block Global Address List synchronization. Administrators can disable this feature using a group policy. For more information, see Disable global address list synchronization for Outlook 2010 in TechNet. Is a note added with the date of the update? A GAL update should add the update date to the notes field. Do you sync with a smarthphone? No note added, nor any other property changes I can determine (I wrote a VBA event to trap for this). I do sync with smartphone (Android) and with an ipad, and have disabled these to no effect. Note: I am the only user on this 365 Exchange account, which I assume is the reason that my name is the only one in the GAL. Also, I've taken the steps found online for disabling Social Connector (which did not appear to be active in the first place). I did take one step since last post: disabled Evernote add-in for contact connections. No mystery updates have occurred since, but it will take a few days to see if that holds longer than the typical intervals at which this has been happening. Something is changing my contacts. I want outlook contact to be the 'hub' when syncing. When I change something in outlook it can sync with Google one way. What are you using to sync Outlook with google contacts? Hi Diane, my company recently upgraded me from Outlook 2010 to 2016. I had turned off GAL sync before, but it has been activated automatically with the upgrade. I can't find a way to turn it off. Do you know how? Thanks, Diane. There was no GALSync key under HKEY_CURRENT_USERSoftware MicrosoftOfficeOutlookSocialConnector. I added one (as a DWORD) and set it to a 2 value. That didn't help. I'll reset it to 0 now. Can you tell me please how to disable the Social Connector as well? Unticking it in Files, options, addins will disable it. If it won't stay disabled, you can set a registry key to never load it. Instructions are here - https://www.slipstick.com/outlook/always-load-an-outlook-addin/ along with a ready to use reg file. Hi Diane, it looks like I was able to turn off the syncing from occurring automatically. The problem is that now I won't even have the option to see updates. Is there any way possible to reinstate the sync with prompt option that was available under Outlook 2010? You need the social connector enabled and the RunAutomaticGALSync registry key set to ask (2). Thanks, Diane. I don't have a RunAutomaticGALSync key. Where should I add it? Should it be a DWORD or QWORD? Should I have keys both for ScheduleContactGALSync and RunAutomaticGALSync? DWORDS, yes, add both if they are not present. Hi Diane, it worked! I needed to add both RunAutomaticGALSync and ScheduleContactGALSync and set them both to 2. Now I'm prompted before the contacts are updated. Thanks again! I have Office 365 based exchange syncing 2 laptops (one is a mac), a desktop, an Iphone, and an Ipad. I'm using Outlook 2016. I have my contacts sorted by " last updated" in my address book. However, every time I check my contacts which should be sorted by "last updated", old contacts I haven't touched for months creeping up in the top 10 of last changed contact. Is this due to Linkedin connector? I have Outlook/Office 2016, so I don't think it has any Social Connector other than maybe Linkedin. ( I think all other social connectors have been discontinued. Are they addresses you sent email to recently? It could be linkedin, if you have it configured in your office 365 account. my contact list in outlook 2016 changes by itself using outlook.com. It adds email addresses to contacts name making it unusable . Do you know if your outlook.com account is on the new server? We have already disabled the GAL Sync by GPO, but a question...we made this kind of Active directory update every 6 months, why our Mobile number has been modified only this time and not the previously updates? Should be an Outlook Update? The fields that gal sync checks would be updated if the GAL value is different than the contact value - to the best of my recollection, the mobile number was always a field that was checked, but if not, then an updated added it to the fields GAL sync checks. some days ago, we made some bulk Active Directory updates, some users, after some days, they notify to us that some contact's attributes has been rewrite. Analyzing, we found that the update was made by the Gal Sync feature of the Outlook Social Connector. What we do not understand, is…..why on some user the updated fields is for example, the Mobile number and on other users is the Addresses, In both case this kind of data was customized in outlook Contacts. We should understand how exactly that features work . it compares the GAL entry to the contact and updates the contact, on the assumption that the gal is the accurate record. If the gal is not updated often, disable the gal sync option..